Every layout needs trees. Lots of them. It can be very costly to forest a model railroad. Fortunately, you can save those expensive kits and ready-builts for key foreground scenes. Leave the rest to weeds, wire and rope ends. 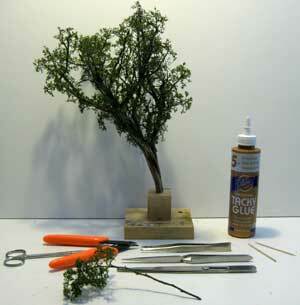 There are many excellent articles on making trees that you'll find in the magazines and on the Internet. Here are a few of my quickie cheapies. First, buy an inexpensive bag of pillow stuffing at Wal-Mart or similar type of store. Pull it apart into balls about one to two inches in size. Lay all the balls alongside one another on the sub-base that you've painted previously with brown latex matte house paint. Some foreground balls can be propped on toothpicks. Spray all the pillow stuffing balls with black paint. While still wet, sprinkle on a few shades of green ground foam. You now have a forest. There's a different method shown in the March 8, 2012 video diary of building the Virginian project railroad by Model Railroader (MR) magazine. [MR can be accessed through the trains.com website. There are lots of bonus videos if you subscribe to the magazine. MR is now also available in digital format. Their technique involves using the black polyfiber that MicroMark sells, dipping chunks in thinned white glue, rolling the clumps in green shades of Woodland Scenics green foam foliage, and then teasing the clumps apart when dry until you have a pleasing shape. It takes a lot to cover a hillside but the canopy looks good when finished. 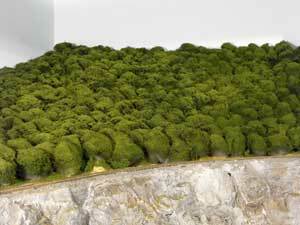 The photo shows mixed twine trees of different heights and shapes on a hillside on my Utopia Northern HO layout. 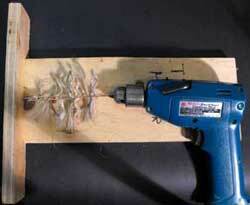 Chuck the two ends of the wire into an electric drill (or hand drill). Slowly turn the drill. The wire will tighten around the strands because the other end is looped over the hook you installed. Then take scissors and snip the ends of the rope until you have a branch shape you like. The tree trunks can be built up with florists' tape or putty and then painted. Spray black paint downwards over the branches while holding over a cardboard box. Then sprinkle on some ground foam. Rotate the armature assembly until you have the branches well covered. Catch the extra foam in the box so you can use it again. Plant the assembly in a piece of extruded foam until it is dry. You can give it a spray of hair fixative if you like. Use a drill bit or other pointed tool to poke a hole in your scenery base. 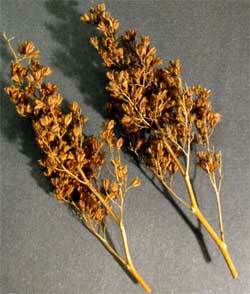 Plant in groups of three or more using some carpenter's glue. Here's my tree making jig. Simple, inexpensive and fast. Unravel a piece of rope or thick wool into individual strands. Cut into various lengths of 2" to 5". Lay the rope strands at right angles to the wires between the two ends. Weeds like spirea or yarrow can quickly be turned into trees with some ground foam and hair spray. I have found that it's easy to make trees from sedum quickly and cheaply. If you want to get picky, refer to the NMRA data sheet D2a.1 issued April, 1961 called Trees and Shrubs. These data sheets are now available on CD-ROM if you're a member of the NMRA. 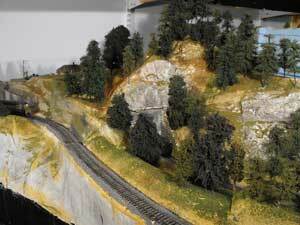 It isn't necessary to spend a fortune for foreground trees for your model railroad. These are trees that need extra attention to look their best. Use them to highlight individual scenes. Canadian Association of Railway Modellers (CARM) member, Bob Sparkes, gave me this picture of a tree he made for the Suncoast Model Railroad Club ON3 module in Clearwater, Florida. Each branch on this handmade tree was individually inserted and glued using tweezers to insert it. You can see some of the tools he used. There are more photos of the Suncoast club in my Train Photos Gallery. Campbell Scale Models had a kit for pine trees that used this method of inserting branches. Other foreground trees are available from Woodland Scenics and other manufacturers who provide white metal branches that can be bent to shape. Go from "trees" to furance filter trees. Return from "trees" to my Home Page.